Redshirt sophomore forward Sarah Overcash attempts a basket during a home game against Maryland last Wednesday. Women’s basketball will be spending its Thanksgiving on the hardwood this year for the second season in a row. The Colonials (1-3) will take on Georgia Tech (3-1) and No. 17 NC State (4-0) in Mexico over the holiday break as a part of the Cancun Challenge. Coming off a loss against Iona Sunday, the Colonials will face two opponents who finished last season with 20 or more wins. Georgia Tech brings a potent interior offense to the floor, while NC State has a band of sharp-shooters from beyond the arc. Both the Colonials’ interior play and perimeter defense will be tested during back-to-back matchups in the upcoming tournament, but GW has the pieces it needs to compete against its tougher opponents. GW’s strongest offense has shown up in the paint. The Colonials have scored 66 of their 174 points so far on the interior and are shooting 30.3 percent from the field on the year compared to 25.4 percent from beyond the arc. In its double-overtime loss against Houston Nov. 9, Georgia Tech let up 38 points in the paint. If GW’s forwards – especially senior Kelsi Mahoney and sophomore Neila Luma, who currently stand at No. 2 and 3 on the team in scoring, respectively – can find the hoop, the squad will be in a solid position to keep up with the Yellow Jackets. But the Yellow Jackets have also put up big numbers of their own in the paint, tallying 48 points down low in the game against Houston. Luma and redshirt sophomore forward Sarah Overcash will have to take on the responsibility of playing tough defense to ensure the Colonials can maintain an advantage on the block. GW will likely look to shore up its post defense and then toss in substantial points on the other end of the floor in order to have the best chance at picking up a win against Georgia Tech. The Colonials will have a tougher go when they take on No. 17 NC State and will need an exceptionally strong performance from post players for a chance at an upset. The Colonials hold a slight advantage in height over the Wolfpack. Four of GW’s starting five stand at 6 feet or taller, while only three of NC State’s starters reach that mark. With size as a weapon, if the Colonials can bolster their performance on the glass – especially with defensive stops that prevent the Wolfpack’s high scorers from earning second-chance shots – they will have a better chance of getting and staying ahead. The Colonials have yet to find the solution to defending guard-oriented teams and NC State is tough to contain on the perimeter. A trio of guards – junior Aislinn Konig, sophomore Kai Crutchfield and graduate student Kiara Leslie – are the team’s top-scorers and have gone a combined 27-for-55 from beyond the arc through four games. 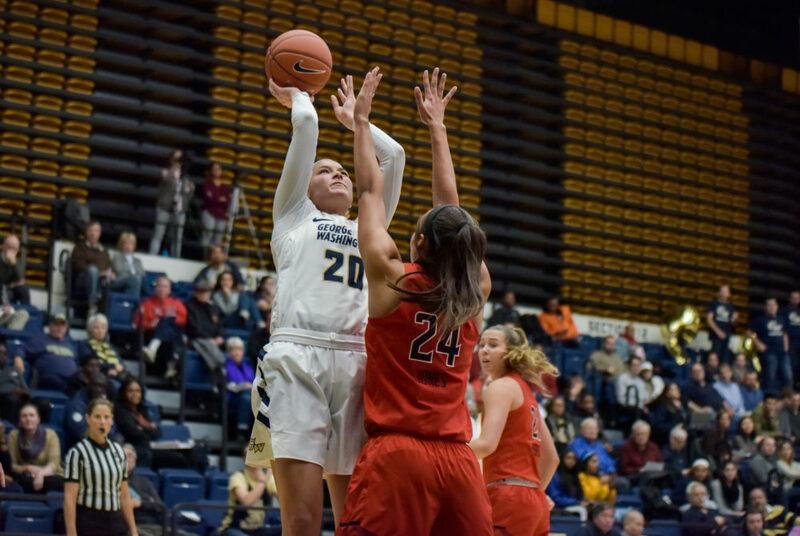 Konig, Leslie and redshirt junior Grace Hunter are averaging more than 13 points per game, but GW’s leading scorer senior guard Mei-Lyn Bautista has garnered an average of 8.3 points per game. NC State’s lowest margin of victory was 15 points against Belmont on Nov. 7, and the Wolfpack have won by at least 17 points over their other three opponents this season. GW could not gain its footing in a Nov. 15 contest against a Maryland offense that showed the same kind of dominance, making it likely that NC State takes control on the offensive side of the ball. GW’s inexperienced lineup has also faltered against recent opponents, including a more seasoned Maryland squad. The youngest players to start for the Wolfpack are juniors, but the Colonials’ starting lineup houses three sophomores. GW and Georgia Tech have both suffered from an inability to consistently knock down shots in past games, but the Yellow Jackets still pose a dynamic threat on offense that the Colonial defense may not be able to withstand. GW’s offense has yet to prove that it can put up the kind of points necessary to counter a squad that puts up high scoring totals. Based off GW’s weak performance against No. 10 Maryland, NC State’s powerhouse offense and veteran lineup have a clear path to victory. If the Colonials can bring dominant post play and a powerful bench to Cancun, they will have a shot at scoring the upset. The Colonials will take on Georgia Tech for the first time in program history on Thanksgiving Day at 4 p.m. They will then take on No. 17 NC State Friday at 4 p.m.